In the past several years, there has been quite a bit of revitalization going on in the City of Tomorrow. We have also seen and heard the news of a massive expansion coming to the countryside of Fantasyland. Meanwhile, the golden age of adventure and the freedom of frontier have not seen major additions or changes in the past several years. There is, however, one character in the Disney directory that could bridge both of these lands and infuse some more action, history, and maybe perhaps some fantastic food, into the area. His name? While this crafty fox has many, he is most often referred to as Zorro. Zorro was its own series for the two years it ran on network television from 1957 until 1959, and in the course of series compiled seventy-eight episodes following the famed fighter of the unfortunate. However, when the protector of California returned in 1960 – 1961 he was presented to viewers in serial form on Walt Disney Presents over the course of four episodes. At the time, Zorro came to households across the country from Frontierland. There may not have been cowboys and Spanish California epitomizers the images, both real and imaginary, of what the West was. This tie to Frontierland is evident in Disneyland’s Zorro Days and the current restaurant Rancho del Zocalo, the town square, where a wrought iron Zorro and Tornado and plenty of swishing Zs decorating the restaurant. 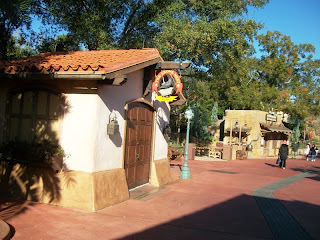 In the Magic Kingdom, a majority of Spanish influence comes across in the architecture of Caribbean Plaza. The similarities in the designs of Caribbean Plaza and Spanish California can be seen in the subtle transition between Adventureland and Frontierland. As an adventurer and a man of the frontier, this would be the perfect location for Zorro to ride once more. An attraction featuring Zorro may not be the most timely inclusion, especially considering the television show aired fifty years ago. Space may be limited due to the proximity to the Walt Disney World Railroad, a recreation of the de la Vega hacienda along the western side of this thoroughfare could offer a variety of experiences. 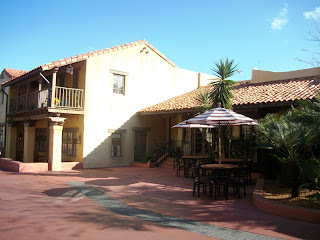 Taking a page from Disneyland, the hacienda could be used as a quick service dining location. Or, working from a swashbuckler next door, Zorro could host his own tutorial. Of course, a blending of these two options, taking the form of a table service restaurant with fight scenes taking place throughout the dining area, would enhance the typical Character Dining meal. The point is, there are plenty of heroes in the Disney catalog that make park and resort appearances, from Davy Crockett to Captain Jack Sparrow, but the inclusion of Zorro among these protagonist is a glaring omission. And while I don’t foresee any of these ideas coming to Walt Disney World anytime soon, it is the foundation upon which the Magic Kingdom is built that we should dream big. Especially when there is so much material and magic to be found in the wily fox of California.